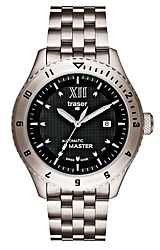 The Traser Automatic Master is the new flagship model of the entire Traser Watch line. Featuring the legendary ETA 25 Jewel Automatic (selfwinding) movement AND Traser's own BLUE TRITIUM ILLUMINATION, this may well be the finest Automatic offered by any Swiss manufacturer. 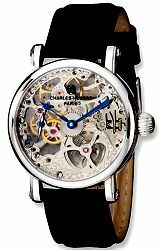 Features include a virtually scratchproof sapphire glass crystal, a surgical grade stainless steel case and an exhibiition case back to view the movement. 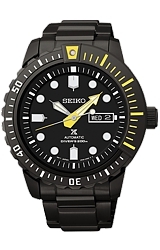 The watch is water resistant to 100 meters or 330 feet below sea level. We are oleased to offer this model with a STAINLESS TELL BRACELET by exclusive arrangement with the Traser Watch Company, H3 mb-microtec. Traser is the world's ONLY manufacturer of Tritium Gas Tube Illumination. Any watch company offering Tritium Illumination must purchase the tritium tubes from Traser, H3 mb-microtec.